Who says the only thing you can do with your dog is take them on a run or walk? 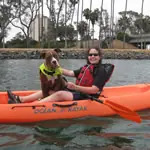 Kayaking is a fun activity to do on a hot day with your dog, especially if your dog enjoys the water. Kayaking is a fantastic workout; you work your arms, core and back. In addition, if you allow Fido to get out and swim, it's a great cross training workout for him or her as it is easy on their joints and it will cool them off. Even if your dog does not "like" the water—most dogs will enjoy being with you and taking in all of the sights and smells the water has to offer. But notice that I said "most dogs", some dogs are not good at sitting still and they get very anxious in the kayak. Here are a few tips to keep in mind before you hit the water. Yes, they make them for dogs. There are a few reasons that Fido should wear one while in the kayak even if they can swim. If Fido falls or jumps out and is scared, the PFD will hold him/her up until you can get to them. There is a handle on the top for easy "pickup" back into the kayak or onto the dock. If your dog is too big to pick up, then you can at least have something to hold onto to steer them in the right direction. Have Fido sit in the kayak while on the dock and get familiar with it. Move it around a little and show them that there is nothing to fear. This is also a great time to see if a one man or tandem kayak will work better for you and Fido. Some big dogs need a tandem kayak in order for you to paddle while the dog lays in the kayak. Taking Fido in the ocean or a fast river is not a good idea on the first time out. Start out in a lake, pond or bay where the water is calm. If Fido does fall or jump out, then he/she can swim to shore. Plus, it will be less work for you while you and your dog get used to paddling together. Don't take Fido out when you're alone. Go with someone else in case you need help. Some dogs get very nervous in the kayak so it may take a tandem kayak team to keep the dog calm until they get acclimated. If you are a couple and have one dog, you may want to both be in the same kayak. Many dogs will want to keep jumping out to be with the other person. No need to create further anxiety for your dog. Keep the whole family together for your kayak adventure. A dog that has good obedience training will do well in a kayak. Your dog should know sit, down, stay and leave it. If there is something that catches your dog's eye—you don't want them to dash off of the kayak after it. Your dog should be able to follow your commands for a more rewarding and relaxing experience. Sign up for an outdoor activity. Dawn Celapino, personal trainer and founder of Leash Your Fitness, a workout company for you and your dog has been training for over 15 years. She loves anything outdoors that involves fitness and her furry friend, Jack.